Siemens is continuously enhancing its Digital Enterprise portfolio for Industrie 4.0, the fourth industrial revolution, i.e. created the technical platform for this transformation with its range of innovative solutions. By implementing Digital Enterprise solutions, Siemens customers can now tap into the full potential of Industrie 4.0. These offerings enable users to achieve greater flexibility, shorter times to market, higher efficiency and better quality, all accomplished with no disruption to current operations. This is a testament to the added value that the Siemens Digital Enterprise offers the discrete manufacturing and process industries. The focus is on further expanding the range of offerings for the Digital Enterprise with solutions featuring greater flexibility for design, manufacturing processes and structures. This includes solutions for digital twins, which are being used today to create a holistic virtual model of the value chain, along with Siemens’ leading automation portfolio, as well as the open, cloud-based IoT operating system MindSphere. Connecting to MindSphere is one of the foundational aspects of new, data-driven business models for customers. By founding MindSphere World, Siemens has taken another step toward expanding the ecosystem around MindSphere. For customers, the MindSphere IoT operating system provides access to new dimensions of connectivity and data analysis. The Digital Enterprise portfolio offers the levers needed to gain these benefits. This includes such aspects as full integration of the individual stages of production and the establishment of a uniform basis for the data, from car design to production planning and all the way to manufacturing and the provision of follow-up services. This applies both to the construction of new production plants and to the upgrading of existing factories, particularly when it comes to expanding the portfolio to include electric and hybrid vehicles. The digital transformation of the processing industry is already in full swing. 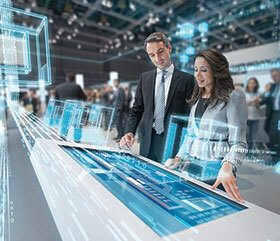 For this task, Siemens offers the required portfolio of solutions with integrated hardware and software and thus enables companies of any size to implement digitalisation. Through Siemens’ Digital Enterprise portfolio, small and medium size businesses, as well as large enterprises, can achieve international competitiveness. Greater flexibility makes it possible to manufacture increasingly diverse model variants efficiently, even when they are produced in smaller quantities.